I think your point is made in the text (further down). I don't think you can generalize about keyword density but you have to find the "golden mean" for your own site goal. I think the idea you are trying to get across is what happens when you go from general to specific keywords. "Samsung DMR77LHS Dishwasher" (very specific) most likely people who have made the decision and are shopping for the best deal, but maybe looking for a review or info to support a buying decision. "Best Price Samsung DMR77LHS Dishwasher" (extremely specific) If you sell this model, you want to rank high on this keyword, but you may not get that many hits! 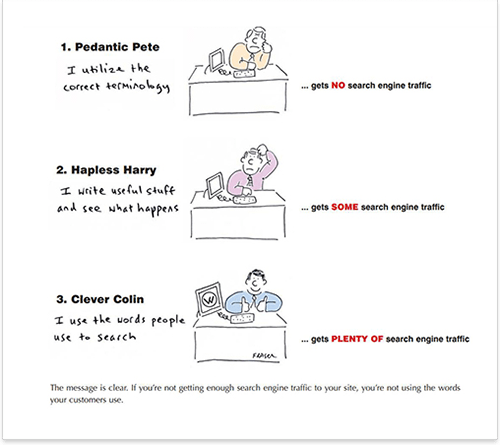 Ironically, the more "generalized" your search terms are, the more people will be searching for them -- but the less likely you will be, to make a sale. Real buyers will use "specific" search terms, because they know what they want. And such people are less numerous than those who use generalized search terms. The trick is to find a "happy medium" between generalized and specific search terms. the point is that the general words are - often - hard to rank well with, and even if you have a good ranking, because of his generality cannot be guarantreed a conversion or a click-trough. 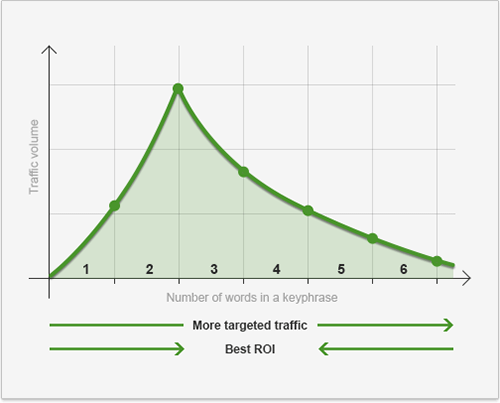 Long term keywords bring less visitors, but a higher rate of conversion.